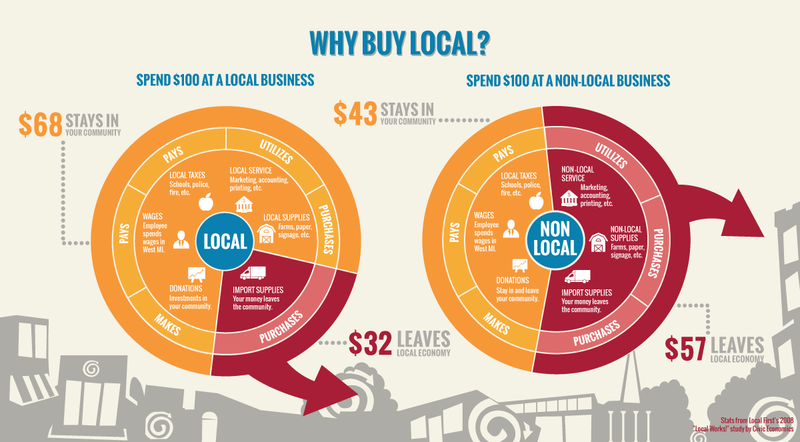 Communities thrive when neighbors buy from locally-owned businesses, those businesses invest in their neighbors as customers and employees, and everyone develops sustainable lifestyles that engage and enhance their physical environment. Engages. It creates and deepens relationships within a community, which becomes more vibrant through collaboration and mutual investment. Humanizes. Physical and economic development occur on a scale that nurtures people and encourages beauty in natural and manmade environments. Preserves. When more citizens are genuine stakeholders, protecting local economic and environmental value is of mutual interest. Strengthens. When citizens and local businesses work together, it catalyzes positive development and the community has structural integrity to withstand economic downturns. Invests. Sustainable local economies and ecosystems grow into markets that are greater than the sum of their parts. Encourages. Intimate connections between customers and businesses facilitate innovation, interaction, and discovery, making for a more vibrant and resilient local economy. Enriches. Reinvesting success in customers, employees, and the local environment makes the entire community wealthier.